When writing The Distraction Addiction and Rest, I could never shake a certain uneasiness with both projects: my concern that the self-help genre lets corporations and culture off the hook. But there’s always the risk that the underlying message would slide from “here are some tools to recognize and solve the problems we all face,” to “these problems are personal; don’t focus on anything beyond yourself.” By channeling your energy into personal empowerment, these messages deflect energy that might be spent questioning, and ultimately challenging, the structural factors that are responsible for creating these problems (or at least making them worse). If there were tips and tricks, single mothers would have already found them. The problem they face isn’t that they’re not smart enough about their lives; when it comes to how they spend their time, they’re some of the most ruthlessly efficient, no-nonsense people I know. The problem is that they live in a society that systematically undervalues the work that parents do; that shifts the burden of parenting disproportionately onto mothers; and expects working women to raise children as if they don’t have careers, and to pursue careers as if they don’t have children. These women don’t need personal tips. They need a different system. Ephrat Livni’s thought-provoking Quartz essay, ”All career advice for women is a form of gaslighting,” reminded me of these concerns. Working women get career advice for how to overcome obstacles and succeed while working in a sexist culture are beyond any individual’s control. And so advocating a do-it-yourself approach to on-the-job equality may actually be a kind of gaslighting—just one more way for institutions to deflect blame and make women question themselves and doubt their sanity. It’s the society we operate in that needs fixing, not how we ask for money, the tone of our voices, or our outfits. In fact, research by Duke University department of neuroscience professors Grainne Fitzsimons, Aaron Kay, and Jae Yun Kim… shows that overemphasizing messages of individual female empowerment diminishes people’s sense of systemic obstacles that require societal redress. It puts major historic problems on the shoulders of individuals, who are actually minor players. Empowerment advice for women provides an “illusion of control” that’s not realistic, the researchers say. The advice may be good insofar as it gives us hope, but it fails to recognize larger, much more powerful forces at work, like a long history of discrimination and patriarchy. The Duke University researchers argue that their findings on DIY equality should worry anyone who believes we need structural and societal change to improve the workplace. ”[T]he more we talk about women leaning in, the more likely people are to hold women responsible, both for causing inequality, and for fixing it,” they write. “The truth,” Livni writes, “is that women face biases that are far too profound and complex to expect any individual to resolve them on their own.” Self-help books run the risk of flattening that complexity, of absolving companies and culture, and personalizing failure. If you don’t make it, if you don’t get a promotion or have your work recognized, it’s not because the deck is stacked against you; it’s because you didn’t lean in enough. This is one reason I’ve been looking at companies that are shortening their working hours. I believe strongly that it’s good for people to be thoughtful about and protective of their time, and that they should take rest seriously and make room for it. Yet it’s also unquestionable that there are huge structural and normative impediments to doing so. 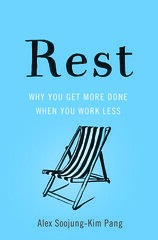 So showing that there are companies that have successfully cut 8 or 10 hours from their working weeks, without sacrificing productivity or profitability, is important: it shows that these structures can change, that the impediments can be lowered— and that this doesn’t have to be a zero-sum game in which one side (the side that usually gets to set the rules of the game, not coincidentally) suspects that it is being cheated. This is why I started my podcast with interviews with heads of companies that are leading this trend: I wanted to make it really clear that these people exist, to amplify their stories, and to explain how they do it. Ultimately, I want other companies to ask, why shouldn’t we do this too? * Another reason I haven’t written much about how companies try to manipulate our attention and time is that I don’t have any illusions about trying to change Facebook’s or Twitter’s strategy. They’ve made enormous amounts of money, and invest ungodly amounts of time and energy, getting people to spend as much time as possible on their sites, and getting them to behave in ways that are appealing to advertisers. If anything, these companies are even more addicted to behavior design than we are. One book isn’t going to get you to rethink your strategy if that strategy has allowed you to pay cash for a mountain in Hawaii or Montana. Get new blog posts, podcasts, events, and more delivered to your inbox!